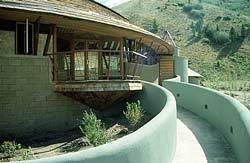 Henry Whiting and his wife Lynn own the only Frank Lloyd Wright house in Idaho. Once completed with the restoration of that house, he wanted to build a new residence closer to Sun Valley. He intended to live in the house and eventually sell it. The program therefore included requirements specific to him as well as those more generic to a house being built to accommodate the future needs of others.